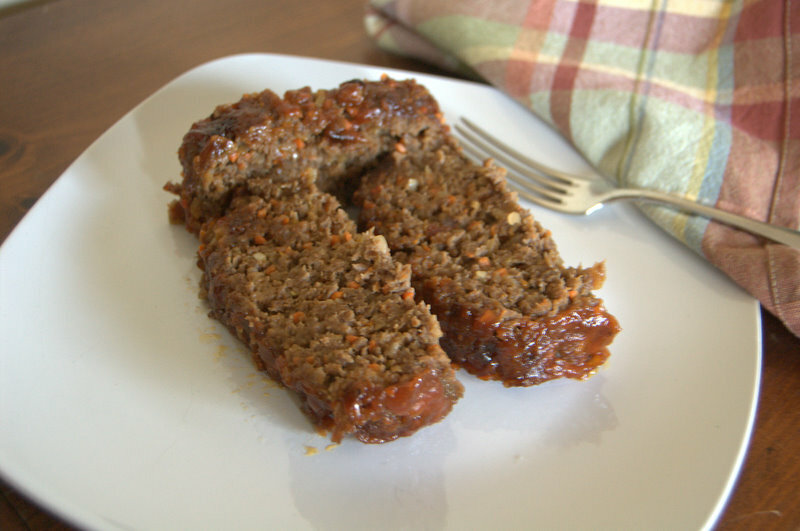 A delicious meatloaf recipe for the whole family to enjoy. With the sauce and everything else in this easy meatloaf, there’s no reason to go searching for another. A simple meatloaf recipe like this one is a star-studded event for your weekday dinner. Whether it’s an Italian meatloaf, a paleo meatloaf, or a slow cooker meatloaf, they’re all great. And THIS meatloaf is just as good if not better. Maybe I’m biased because I’m really liking my cooking lately, or it’s the fact that I’ve been deprived of a good meatloaf recipe all my life. One of the things I like about eating this is that you can have a variety of ingredients in the meatloaf. I have to be honest, I always dreaded hated when my mother would make her meatloaf for dinner. Hers was dry and I had to drown it in ketchup. Not only that, but just the word “meatloaf” is a HUGE turnoff for me! Meat. Loaf. A loaf of meat. BLECH!! Really? Who thought of that?! I know that that’s what it is, but that word… Couldn’t it have been named something like, I don’t know, meat… Ah, phooey, I can’t think of anything. I looked up synonyms for loaf on Thesaurus.com and found some interesting ones. All we need to do is insert the word meat in front of them. Meat Bun, Meat Cake (DEFINITELY NOT – how can those two words possible be uttered in the same sentence?! ), Meat Cube, Meat Dough, Meat Lump, Meat Mass, Meat Slab, or you could go with visually pleasing Meat Twist. Unfortunately, meat loaf, I guess, is the best choice. SAVE THIS MEATLOAF RECIPE TO YOUR FAVORITE PINTEREST BOARD! I’m sure some of you are too young to remember The Electric Company. You were deprived. It was a wonderful show with Bill Cosby as Hank, a guy named Crank, Rita Moreno and Morgan Freeman. I used to watch that and Sesame Street ALL the time! Hence my love for the Muppets and reference to them here. Complete the day with a great dessert like this apple sharlotka from the amazing smittenkitchen. I can’t get enough of skinnytaste and her cheesecake brownies. They’re one of a kind! I had the trio of ground meats in the freezer from the meatballs I made on Day 128, and those were yummy, so I wanted to see how they would be in a…(gulp) meatloaf. Not really, but I knew it was something I should at least try. Preheat oven to 400 degrees. Cover a baking rack in tin foil and spray generously with cooking spray. Place in a rimmed baking sheet and set aside. 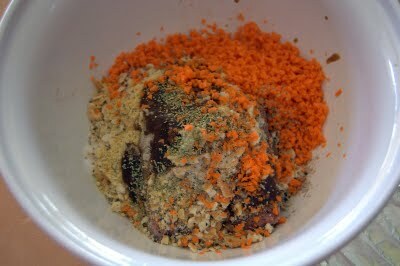 In a small bowl, mix chili sauce and flour until smooth. In a large bowl, combine pork, veal, beef, chili sauce/flour mixture, the packet of soup mix, carrot, garlic, steak sauce, Ritz Crackers, salt, and pepper. 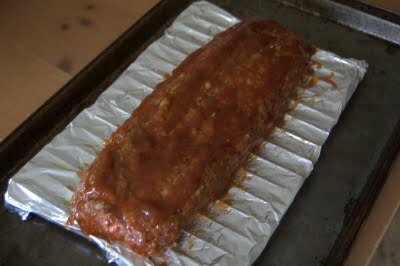 Place meat mixture onto the foil covered prepared rack and shape into a 3 x 11-inch loaf (of meat). Using a pastry brush, spread the glaze over the top and sides of the loaf. Bake for 50-55 minutes when a meat thermometer inserted tells you it's 160 degrees. I love how every week there can be something different for dinner. Or, you can have it every week and not get tired of it. 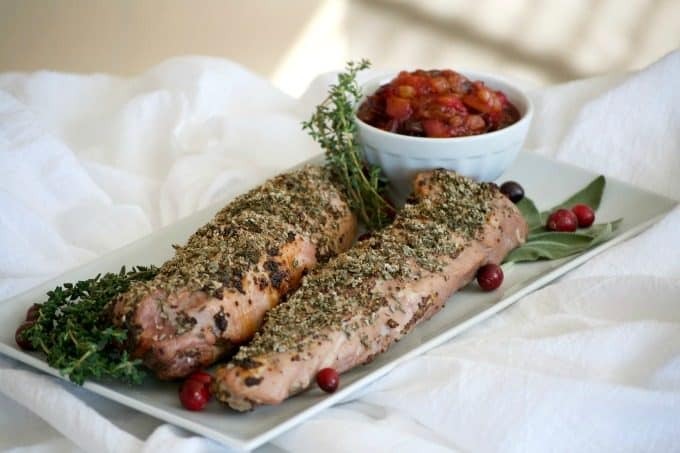 This dijon herb roasted pork cranberry pear chutney is EXACTLY that. Everyone wants more time and I couldn’t agree more. 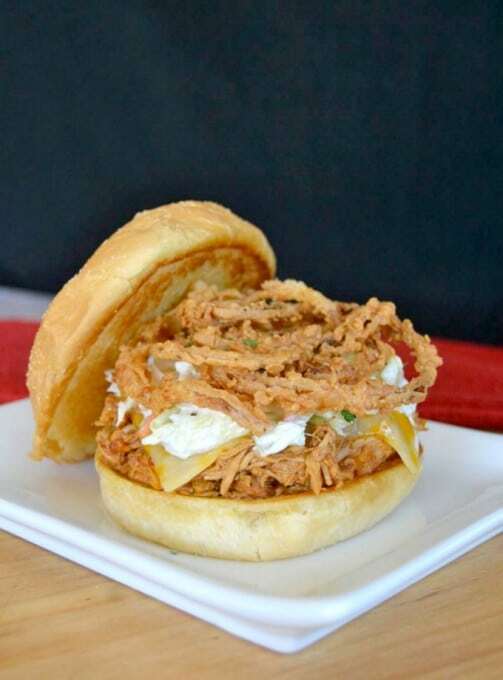 However, when you are crazy busy, let this slow cooker chicken sandwich help you when dinner isn’t on your mind. The family will love it! 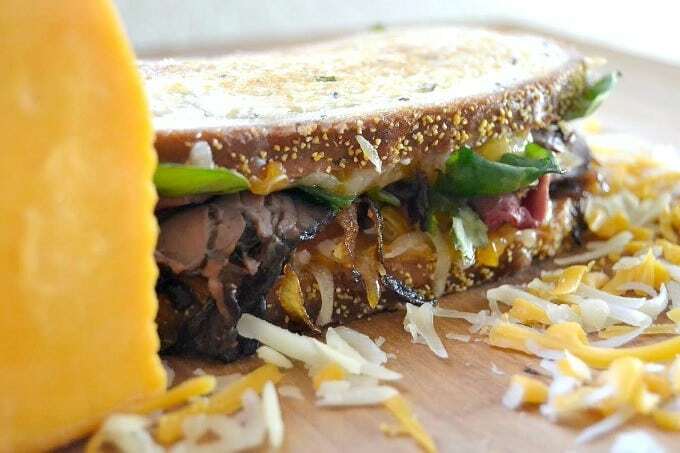 I can’t think of a grilled cheese sandwich the same when this ultimate grilled cheese roast beef is the one I want every time. My apologies for the slightly blurry pictures. When I take them, they look sharp, but then when I upload it’s a different story. Guess it’s time to have the old eyes checked. I have to say that I was quite pleased with the taste of this loaf of meat – very pleasantly surprised with the outcome. I was curious as to how it would bind together without the eggs, but it held together very well and I didn’t even miss them. The family really liked it, too and Mr. 365 said it was the best he’d ever had. Then our oldest said, “Well, you were really hungry anyway!” He smiled sheepishly and nodded his head. I made it free form instead of putting it into a loaf pan because there’s more of a “crust” that way and with a pan, there’s just too much meat for me. I don’t like thick hamburgers either. I rate everything I bake on a scale of 1-4 with 1 being “DON’T waste your time or money” and a 4 being “you haven’t LIVED until you’ve made this!”. Believe it or not, this Tasty Meatloaf earned 3½ rolling pins! I will definitely make this version the next time we need dinner and there aren’t any eggs in the fridge. Free formed meatloaf is always SO much tastier!! A friend taught me that trick. 🙂 I haven’t made a meatloaf in years. My husband would be in heaven. Go for it, Mary! A definite way to win him over. I make a meatloaf called Not Your Mom’s Meatloaf too. When I have the time I go all out and make it into a meatloaf spiral with layers of spinach and cheese. My whole family will eat it which is a huge win for me. That sounds good! I definitely check it out. OMG!! Growing up I felt the same way about meatloaf! My mom’s was so dry. She cooked the way my dad liked (meat well well done!). I remember making my first meatloaf (40 years ago) and was surprised at how well I loved it! The best part…….the leftovers for sandwiches!! Your recipe looks awesome. I will definitely make this the next time I make meatloaf!